Injen Intake Heat Shield for 3.5" Intakes5BrettSeptember 4, 2010i got the cold air intake with the hydro shield and the heat sheild. it all works great. was easy to put in. NewLevel Motors is a great company. The Injen Heat Shield is a great addition to your air intake system, whether it is an Injen brand, or even another brand besides Injen! By deflecting hot air under the hood away from the air filter, an Injen heat shield helps cool the intake air temperature and boost power while improving engine bay appearance. Features polished aluminum construction and etched Injen logo. 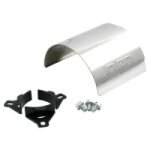 The part number for this item is HS3500P and it fits all intakes (any brand) with a 3.5" Diameter piping.